What a transformation! Can you believe what has been accomplished in just 3 hours?! 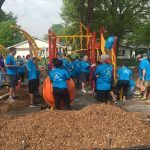 We’ve made picnic tables, a connect 4 game, benches and look at how much of the playground system is already set up–not to mention the mulch! Wow! Where will we be in another 2 and half hours? Updates are awaiting! Transforming the Phoenix Academy Playground in 6 hours? 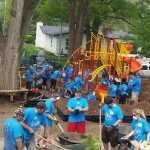 Transforming Phoenix Academy playground in 6 hours. Today is the big day! 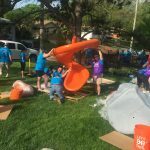 The Phoenix Academy “Build it with KaBOOM” We have 200 volunteers here from Pacific Life Foundation and Phoenix Academy working to transform our playground. Can we do it in 6 hours? Stay tuned! #playmatters. 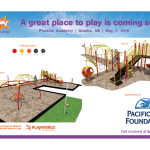 Phoenix Academy is getting a NEW playground… and we need your help!